Lifeway Financial Corporation provides investment management services to clients on a fee-only basis. The proper execution of any investment management strategy requires a clear investment philosophy and a structured investment management process. It is the objective of Lifeway to consistently provide a highly organized system that executes in-depth investment solutions in direct relation to the client’s needs and goals. Achieving this objective within a global environment of accelerating economic and capital market change requires a consistent, proactive approach to investment management. Such an approach must be driven by a guiding set of beliefs that reflect a clear investment philosophy. The management of a client’s financial capital is primarily guided by the client’s objectives, preferences, and constraints. A client’s objectives, preferences and constraints are best determined, understood, and maintained through a recurring, comprehensive financial planning process. Achieving realistic investment objectives requires the commitment to a long-term, comprehensive investment approach and the consistent execution of a clear investment management discipline. 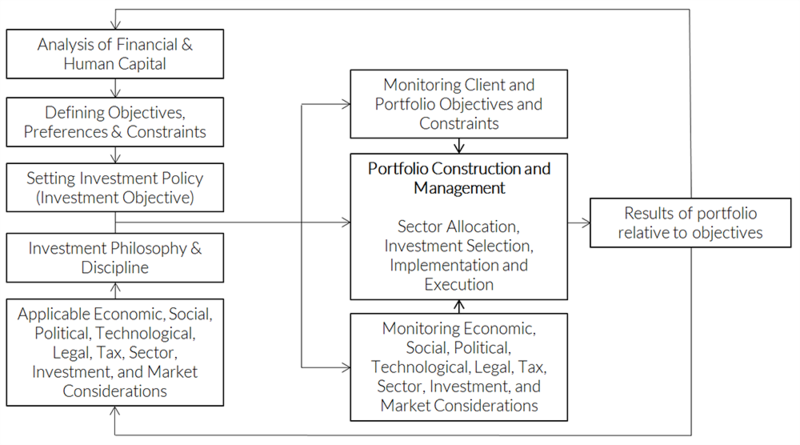 Achieving desired investment results is primarily determined by fundamental asset allocation decisions and investment execution at the Policy, Sector and Investment levels. The management of asset diversification within interdependent asset classes is essential in controlling total portfolio risk. The relationship between the risk assumed and the return expected is a critical factor within the investment selection process. The goal of the Lifeway Financial Corporation investment process is to effectively manage client assets within the context of the client’s objectives, preferences, and constraints. A quarterly management fee is charged for investment management services and includes all meetings and communications throughout the year.